Chemists at the University of California, San Diego and Purdue University have discovered that natural chemical processes in the atmosphere may be removing smog and other damaging hydrocarbons at a faster rate than once believed. In the May 24th issue of the Proceedings of the National Academy of Sciences, the scientists report that naturally-occurring atmospheric chemicals react with sunlight more effectively than scientists previously thought, breaking down smog and other pollutants after they absorb energy from sunlight. While many molecules have been known to behave in this way—producing natural air cleaners called OH radicals—the chemicals the team studied have for the first time been observed to produce smog-destroying OH radicals at low ultraviolet wavelengths. This observation had long eluded scientists primarily because photochemistry at these wavelengths had been difficult to study. But a sensitive laser technique allowed the scientists—Amitabha Sinha and Jamie Matthews of UCSD and Joseph Francisco of Purdue—to record these reactions for the first time. Much of the hydrocarbon pollutants pumped into the atmosphere by humans result from burning organic matter such as wood or fossil fuels. The atmosphere has three main ways to cleanse itself of such pollutants. Two are relatively direct: water droplets in clouds absorb and rain them out of the atmosphere or sunlight breaks the molecules apart. OH radicals arise naturally from many atmospheric constituents. The effect they have on pollution has long been factored into models that describe the atmosphere and attempt to predict how it will react to increasing quantities of hydrocarbon pollutants, which generate smog. But these models do not always function well, Francisco said, in part because OH radicals are in some ways an unknown quantity. The experiments—which Sinha and Matthews, a graduate student in his laboratory, performed at UCSD—used a laser technique that allowed the team to look at the OH radical-producing molecules in a new way. More precisely, it allowed them to observe a portion of the molecules’ spectrum which had been something of a blind spot for atmospheric scientists, who often detect chemical reactions by perceiving the telltale light frequencies that certain reactions are known to emit or absorb. Many sources of OH radicals strongly absorb UV light, making them easily detectable. However, the weak absorptions in the lower region of the ultraviolet spectrum, from wavelengths of about 360 to 630 nanometers, has been more challenging. The sensitive laser technique, called “action spectroscopy,” however, enabled the team to characterize the minute quantities of radiation absorbed by a substance called methyl hydroperoxide when it breaks up in sunlight and forms OH radicals. 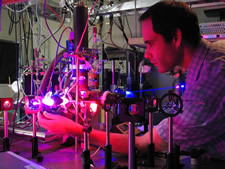 Methyl hydroperoxide is one of the substances that can absorb light in the lower UV spectrum, and the team theorizes that the sensitive laser technique, called action spectroscopy, could reveal OH radical production from other chemically related molecules as well. Francisco, who contributed to the study’s computations, said he hopes the study also would encourage other refinements to atmospheric models.